With comic-con just around the corner, I wanted to dust off one of two comic-related cookbooks in my possession: The Cartoonist Cookbook. 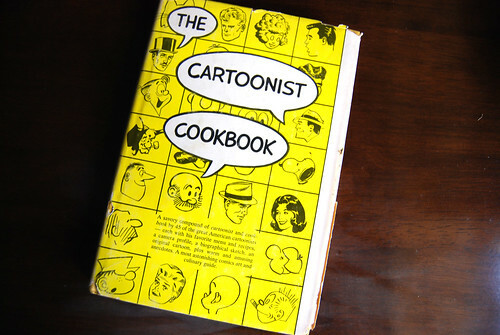 The cookbook was published in 1966 and features cartoonists and their comic strips, mostly unknown by the current generation. I’ve never heard of, much less read, The Heart of Juliet Jones or Bringing Up Father. Those are just two strips mentioned among a host of others, but among them is a very well-known one: Peanuts by Charles Schulz. I’ve written about the cookbook before, mostly about the outdated recipes in the book (peanut butter soup??). 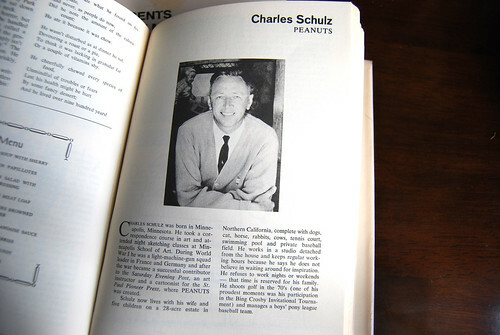 I must have skimmed over Charles Schulz’s entry because there wasn’t an accompanying recipe, only an explanation that he cannot cook anything. It’s a shame the creator of Peanuts had nothing to submit except his wife’s secret of adding a quarter cup of syrup to pancake batter. There’s not even a recipe for pancakes. 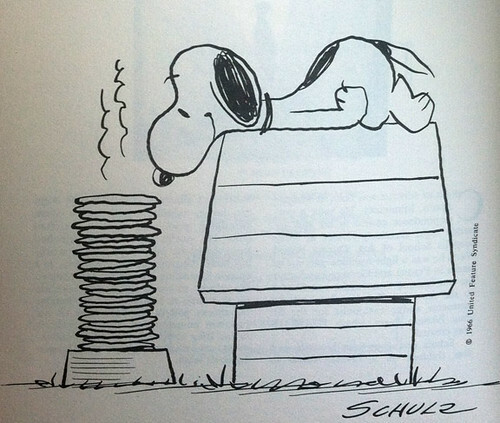 So with much respect to Charles Schulz, here’s my recipe for pancakes with his suggestion. Pour in the milk, egg, butter and syrup. Mix until smooth. Heat a lightly oiled pan over medium heat and pour some batter onto the pan. Flip when edges are dry and some bubbles form on top. Repeat until all batter is used. That’s interesting they even featured him in the cookbook if he didn’t have a recipe to share! I guess he was famous enough to include him no matter what. Adding syrup to the batter though sounds like a really excellent idea. Maybe add cooked sausages into the batter, too! I like the idea of cooked sausages — kind of a redux of pigs in a blanket.